Prototype: Prototype: Diesel locomotive road number 216 224-6, a type Tds 930 dump car, a petroleum oil tank car, and a sliding wall boxcar. Model: Model: The locomotive has a 21-pin digital interface connector and a powerful motor. 2 axles powered. Traction tires. The triple headlights change over with the direction of travel. The cars have close couplers. Total length over the buffers 65.2 cm / 25-11/16". Contents: 12 no. 62130 curved track, 6 no. 62188 straight track, 6 no. 62172 straight track. A Trix locomotive controller and an 18 VA switched mode power pack are included. This starter set can be expanded with the C Track extension set, item number 62900, and with the entire Trix C Track program. 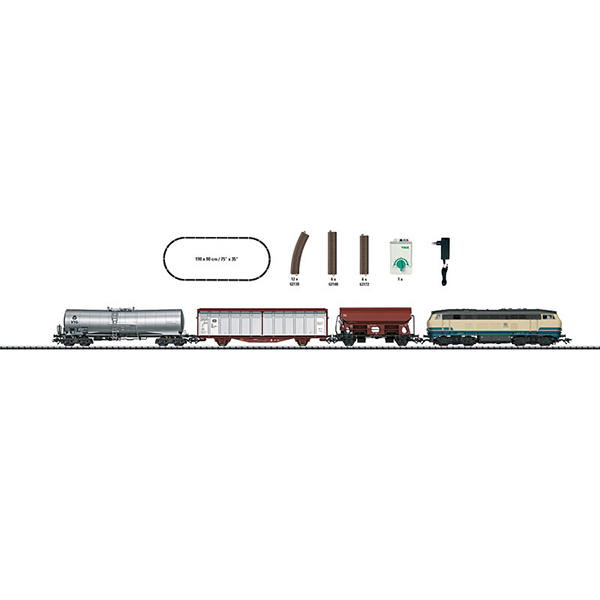 Charlie's Tip: Many additional freight cars to go with this train can be found in the Märklin program. Your specialty dealer ajckids.com will be happy to exchange the wheel sets free of charge.